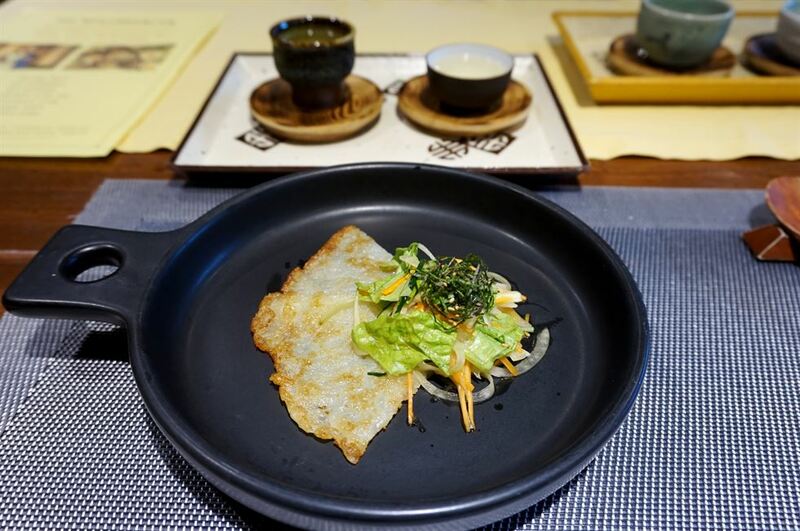 JEJU -- The island of Jeju, off the southern coast of the Korean peninsula, is in a festive mood this week with an abundance of food and wine as the annual Jeju Food and Wine Festival is underway from May 10 to 19. Into its third year, the festival is now settled as one of the major yearly events held on the island, attracting tourists and locals to enjoy the food and drinks it has to offer. Only keen travelers will notice, however, that there is something special about the drinks served at the restaurants, when visiting those that are participating in the Gourmet Week as part of the festival. For instance, when visiting Shinehanmo, a restaurant specializing in tofu dishes, there will be locally brewed Jeju Wit Ale available as a signature drink while Nangpoon Bapsang, a traditional Korean fine dining restaurant, will pair traditional liquor such as Gosorisool or Omegisool (sool means liquor in Korean) -- all locally distilled on Jeju -- with their food. It's not only that these drinks are locally made on the island that makes them special -- what's more fascinating is that travelers, if they wish, are able to visit the breweries where they are made and even experience making it on their own. At Nangpoon Bapsang, where only course menu is available, customers can choose if they want to pair traditional drinks with it. When they do, each dish comes with a local pairing. When this reporter visited, it was during the festival period so the restaurant had a special festival menu for the week. Although the regular menu comes with pairing, the special menu was also available with paired drinks upon request. The drinks come in the order of strength -- starting with lighter ones with lower alcohol percentage and ending with the strongest and heaviest drinks. After the first appetizer, a relatively light drink of 11 degrees alcohol, Nimome was served followed by Omegisool, at 13 percent. "We were the first restaurant to serve Nimome when it was launched last year and it was very well received. It's fresh even without carbonic acid. It's popular among women. This one is called Hanbadang, which is makgeolli (rice wine) made with Jeju rice. The alcohol percentage is higher than other makgeollis," said Yang Yong-jin, son of master Kim Ji-soon who owns and runs Nangpoon Bapsang. Kim was officially dubbed "local food master of Jeju" by the provincial government in 2010. "Nimome goes well with salad and lighter food and is used as an aperitif drink. Makgeolli goes well with jeon (pancakes)." The food came likewise -- in the order of light to heavy -- starting with seaweed salad, buckwheat rice porridge, potato pancake, sauteed mackerel and herbs, pork with pureed soybean, seaweed soup and abalone mixed with rice and ending with hallabong (Jeju mandarin) jelly and shindari (rice drink). Nimome, which means "In Your Heart" in the Jeju dialect, is fermented mandarin rice wine made from rice and mandarin skin, developed by a local winery called Jeju Saemju. Omegisool is local liquor made from omegitteok (omegi rice cake) and yeast. Omegi is glutinous millet that used to be abundantly produced on Jeju Island. "These are Omegisool and Nokko's Tears. The latter has a legend to it. There is a mountain called Soowolbong on Jeju and in the middle of a cliff, there's a place where water drips. Siblings called Soowol and Nokko were climbing that mountain to get herbs for their sick mother when Soowol fell and died. Nokko cried and was frozen there. So this drink, which is made from acanthopanax from that mountain, came to be called Nokko's Tears. Everybody likes this one because it's herby but very mild," said Yang. "Gosorisool goes well with heavy food. And this one is called Hwangchiljoo made from the roots of a tree called Hwangchil." Gosorisool is liquor distilled from Omegisool and aged for a long period of time. Although made from the same initial ingredients, Gosorisool, being distilled liquor, has higher alcohol percentage of between 29 and 40 percent. Having visited Jeju Saemju before heading to eat at Nangpoon Bapsang, the pairings all made sense and the explanations were easily understandable. Jeju Saemju is the local distillery where some of the liquors served at Nangpoon Bapsang are produced. All of Jeju's famous restaurants are tucked away in little alleys that are hard to find even with navigation. Jeju Saemju was also on what looked like an off-road in the town of Aewol. But one big liquor bottle-shaped stone tower caught our eye. 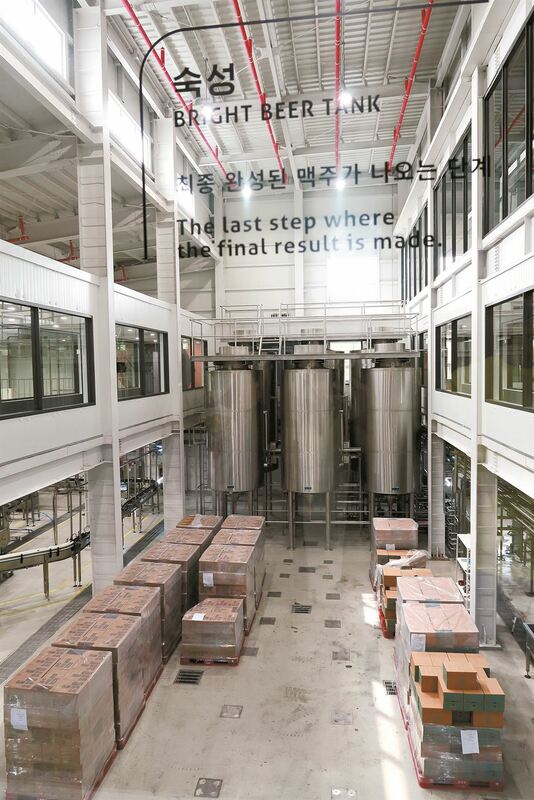 Stepping into the office of the Jeju Saemju distillery, we were greeted by its founder and CEO Kim Suk-hee, an energetic female figure who has run the place for over a decade. "We have four different types of liquor produced here. Six months later we'll have a new line added to the existing four. We currently have Nimome, Gosori, Omegi and Seuri," she said. Gosorisool is, simply put, Jeju soju. The word gosori is Jeju dialect referring to the special bottle to pour soju. "Gosorisool is intangible cultural asset no. 11 and omegisool is no. 3. These two are the traditional Jeju liquors. Jeju used to be abundant with glutinous millet but not anymore. Farmers don't grow it anymore so it's five times the price of rice. As a result, I reduced the amount of millet in the liquor and the taste became softer," said Kim. 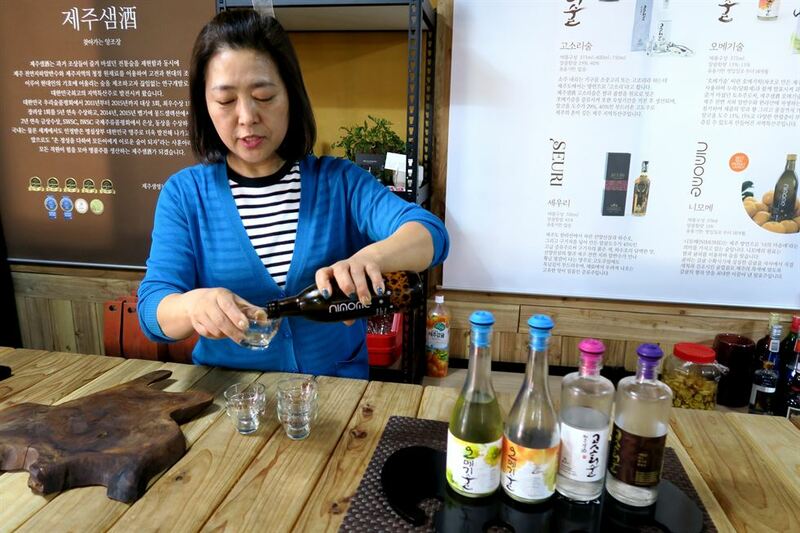 "It should be called Jeju soju like Gaeseong soju in North Korea, but the name comes from the tool that is used for pouring soju. So Jeju's traditional liquor became gosorisool." Ironically, although the local drink is widely available on Jeju, the liquor is mostly consumed in Seoul and other metropolitan cities on the mainland. "Jeju islanders find it expensive. They are not yet up to that culture of drinking good liquor with good food. Koreans think they should get drunk when they drink so this is expensive for that purpose. But if they shift their mindset and drink pleasantly, this is affordable (around 13,000 won). I don't know why people eat good food but not drink good sool," said Kim. "People in Seoul seem to be pairing good alcohol with food these days. A good sign is that Jeju people began to drink our products from a year ago." Kim's distillery was designated as "Visiting Distillery" by the agriculture ministry in 2014 as an effort by the central government to encourage tours. It was since then that this business took off. "Government recognition helped a lot. I started back in 2005 but I had a hard time making money. I poured everything in but still people didn't know about or recognize traditional liquor. Only one out of a hundred would acknowledge the good taste. It was only in 2014 that the business started operating in the black," she said. Visitors here can purchase liquor at almost one third of the price at restaurants and also experience making cocktails with omegisool and gosorisool as a base liquor and also make "shindari," a yogurt-like drink fermented with rice and yeast. "We get about seven to eight individual groups visiting us every day -- mostly tourists from the mainland or foreigners. I don't receive group tours because I can't handle that," said Kim. At Shinehanmo, which serves an array of tofu dishes, all of the food went quite well with the light and sour Jeju Wit Ale. But initially, the drink was crafted to be paired best with Jeju's most famous ingredient -- black pork. "We thought a lot about which food would go best with our beer and we thought of black pork. Food pairing also applies to beer," said Kim Hyun-kee, tour manager at Jeju Beer during a tour offered at the brewery located in Hanlim. The beer, according to the company, also pairs well with greasy fish such as mackerel and yellowtail fish sashimi as well as gogi guksu, a local Jeju meat noodle. "The standard of good taste is very subjective so we decided to focus on creating good beer. That had to start with the ingredients. On Jeju we have clean water, and organically-grown mandarins which we use for flavor. We also have great recipe from Brooklyn Brewery's James Beard Award winning brewmaster Garrett Oliver who has 30 years of knowhow. We've collaborated with him and several other brewers with over 15 years of experience," said Kim, during the 40 minute tour. When entering the transparent glass building, visitors are guided to the third floor reception where they gather for a tour held every hour. During the peak season, the brewery offers tours every 30 minutes. When the pre-registered group is gathered, a tour guide takes the group to the second floor where the beer tour begins. It starts with a brief introduction about the ingredients that go into beer making -- water, yeast, hop, and malt -- and the beer making process is neatly summed up by a light projection on a wall. "First we grind the wheat. Then we put it in a tank and mix in the water. When it warms up, sugar is extracted. Then it goes through a filtering process and hops are added and the mix is boiled to extract flavor. Finally it goes into a fermentation tank where it matures. For wit ale which we produce now, this takes two weeks," said Kim. 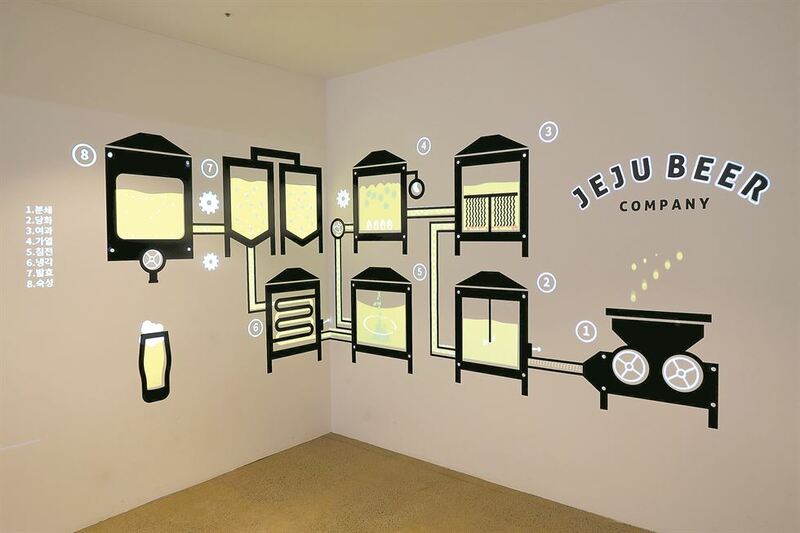 The next section was about the Jeju Beer brand and the third section had different types of beer produced in the world categorized in graphics on the wall. Opposite the wall was transparent glass that showed the brew house where the wort is made. 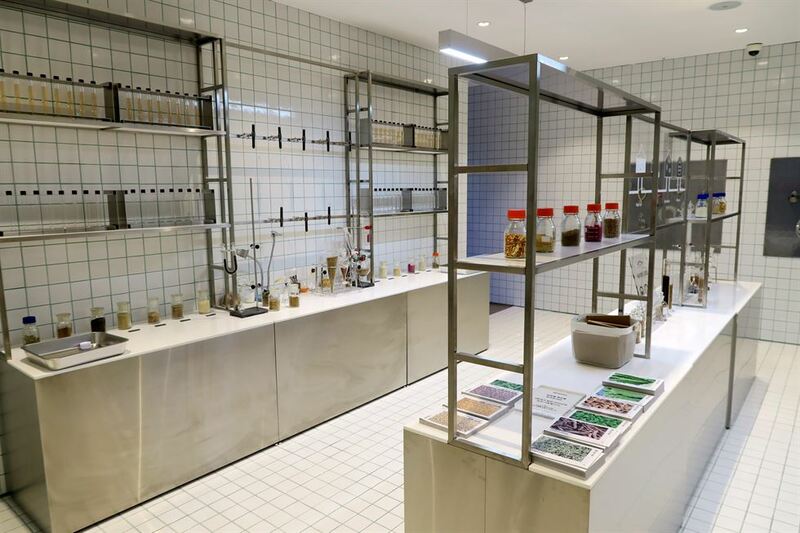 The fourth section had a lab where various ingredients were displayed to be seen, smelled and touched. "These are all the ingredients we're experimenting with for the next beer," said Kim, holding up bottles with coriander seeds and mango powder. The final section was a long glass corridor on the opposite side of which were the filtering tanks and fermentation tanks followed by the bottling and canning systems, all viewable through the glass. "You can see a machine for corking bottles at the far end. We're going to launch corked bottles for beer. It's the first of its kind in Korea although it's popular overseas. You'll be able to open beer instead of wine on special occasions," said Kim. The brewery, situated at the western end of Jeju, is the fourth largest in the country following the big names Cass, Hite Jinro, and Lotte. Although there's a big gap between the third and fourth, Jeju Beer is proud to be the largest among craft breweries that produce creative flavors. Jeju Beer opened in August last year, the preparation for which took five years. "Right now we have only one type of beer -- Jeju Wit Ale which is wheat beer. The second brand will come out in June and we're planning to have at least four to five brands. Our goal is to produce different styles of beer that aren't common in Korea," said Kim.